The page contains an SNMP (Simple Network Management Protocol) MIB file list loaded by the client. The files are necessary to display information about SNMP variables supported by the target host in the SNMP MIB browser. The browser is used to configure SNMP monitors. the default MIB files are located in the mibs subdirectory of the product installation directory; you can specify additional MIB files and/or unload some of the default files on this page. 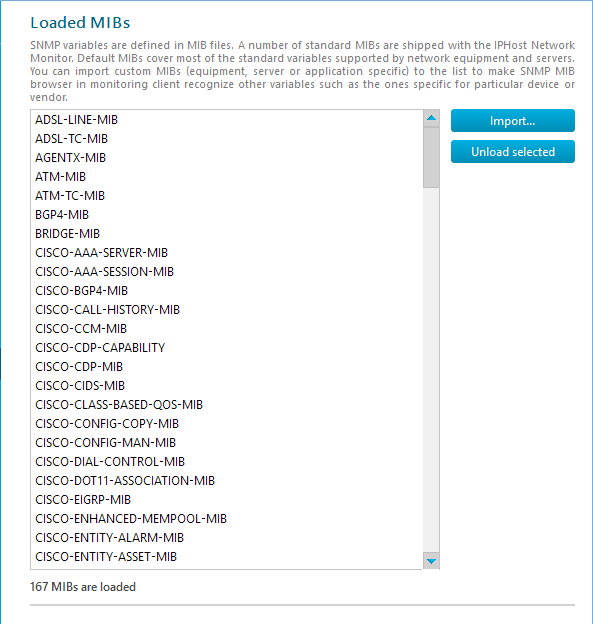 You can do it directly from the SNMP MIB browser as well. Copyright © 2008-2019 ProWide Labs Ltd.